This is probably one of my favourite lightning quick week night dinners during the summer when my allotment is throwing out courgettes like missiles. It’s simple to make and contains chilli, garlic and salt – ingredients which go really well together – in fact the garlic I’ve used in the picture was also home grown. The other lovely aspect of this dish is you can fiddle with the ratios depending on your taste and make enough for a a family or simply a meal for one. 1) Boil a saucepan of water and cook pasta as pack instructions. 2) Using a box grater grate the courgettes on the medium blades. 3) Heat oil in frying pan over medium heat and add chilli and garlic. 4) Add courgettes, stir and add a pinch of salt and couple of grinds of black pepper. 5) Stir occasionally while pasta cooks but do not let courgettes brown, you are trying to draw some of the moisture out of the vegetables not brown them. 6) Drain pasta and add to the courgettes, stir, transfer to a plate or bowl and grate over some Parmigiano-Reggiano if you have some. 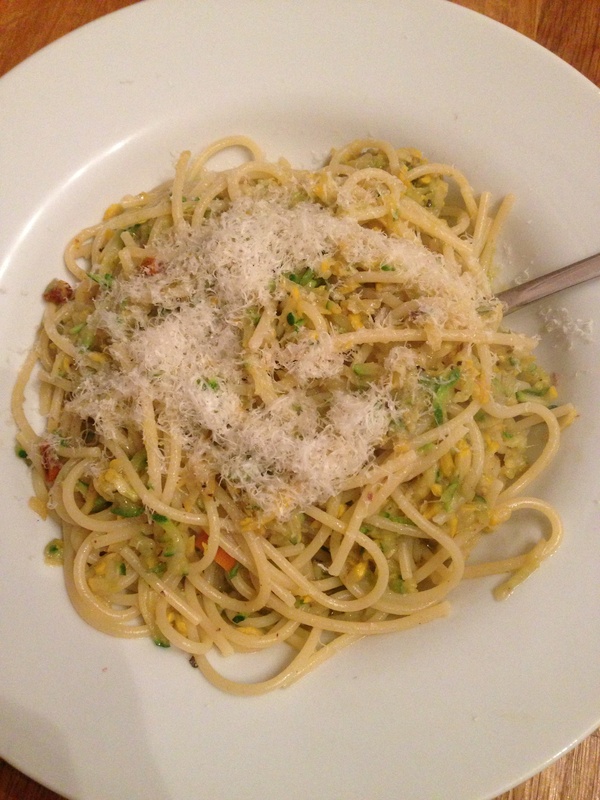 This entry was posted in Cook, Grow and tagged chilli, courgette, garlic, pasta, quick, salt., spaghetti by stevemyalleats. Bookmark the permalink.